Wonderful review. The book sounds excellent, and definitely one I’d like to read. Your blog is a bad influence too…….. I do think you would like this. 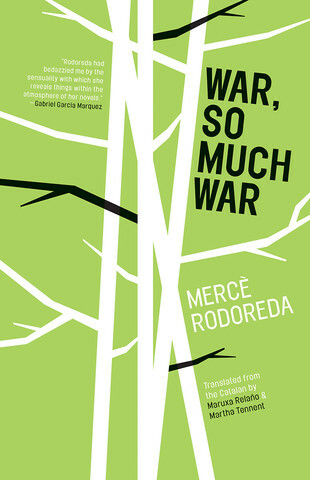 The language is wonderful and it is a profoundly moving yet unusual war novel. Great review, Joe. I reviewed it as well but I had mixed feelings about it. I think the fairytale/surreal aspects were tough for me. But it was a very interesting read! I remember reading your review and thinking that I would like it for some of the reasons you didn’t. By contrast I was trying to read Physics of Sorrow which is also shortlisted (and I can’t remember what you thought but it seems to me you did read it), and although I admire the idea, it is too folkloric and magical for me right now. I’m just not in the mood. I decided to put it aside for a later date. I think the spareness of the language really made this one work for me. This sounds wonderful. I read Rodoreda’s magnificent ‘The Time of the Doves’ several years ago, and it haunts me still. I’d definitely love to read another, so this is going on the wish list! I bought Time of the Doves planning to start there but the BTBA nomination pushed my hand. I will definitely read more. I read In Diamond Square earlier this year (also known, in a different translation, as The Time of the Doves) – it seems like a more realistic version of what you describe. Great to see Open Letter have made so much of her work available. I understand that her work became more surreal toward the end of her life. I also have Time of the Doves, having originally planned to start with that. I’ve now bought her last book, Death in Spring, so there will be more Rodoreda in my reading for certain!